Engineers of general lighting area are focused on designing compact, intelligent and energy efficient systems, which could be realized by adding the feature of automatic switching off, when no human presence is detected. Today these intelligent sensors are mainly based on passive infrared (PIR) technology, that is perfect for detecting human motion with huge amplitude on a large detection area, however not effective with tiny movements, and also unable to distinguish between approaching and leaving of objects. Radar sensors integrated in an intelligent lighting system could overcome the disadvantages of PIR sensors, being able to detect minor movements, like speaking, typing or even breathing. In the past radar systems could only be set up by the use of expensive, big and heavy components like wave guides. Today, using planar technology, the sensor modules are small, cost effective and robust. The passive infrared sensor (PIR) detects changes in the heat flux caused by the motion of human body, that is in contact with the environment by changing its temperature. As the construction regards, PIR detectors incorporate a Fresnel lens in order to focus the radiation to the sensor elements, and also having dual or quad-elements to subtract the ambient temperature and reduce the number of false alarms. PIR sensors can detect correctly horizontal movements, while radial movements cannot always be detected. There are also intelligent digital PIR sensors available like Nicera‘ s pyroelectric passive infrared sensor (PIR-sensor). 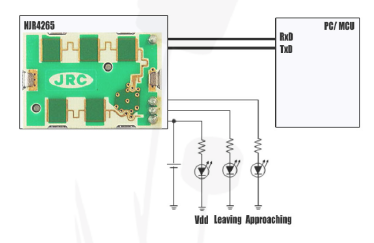 With this product, a movement detector can be designed with only a few external devices. Disadvantage of the PIR technology is the need of the Fresnel lens, the ability to detect only remarkable human motion in tangential direction. Radar sensors can detect the slight movements of the human body, and such sensors integrated in an intelligent system, could overcome the problems encountered by PIR sensors. However, to fulfill all the requirements, these sensors need to be very small, low cost, low power and low energy consumption. In the past radar systems could only be set up by the use of expensive, big and heavy components like wave guides. Today, using planar technology, the sensor modules are small, cost effective and robust. The radar modules are emitting electromagnetic radiation in the radio frequency range of 1 8...27GHz, the socalled K-Band. A portion of this range from 24...24.250GHz is the ISM (Industrial, Science and Medical) radio band. The K-band is allowed to use nearly worldwide with no limitations. The radar radiation is reflected by solid objects and the reflected radiation is used for detecting objects. The amount of reflected radiation, which is detected by the radar module, is not only depending on the distance of the object, but also on its size and material. A metal surface is a very good radar target due to its high radar cross-section, and even a human being is reflecting quite well because of high wr -value of water contained by the body. 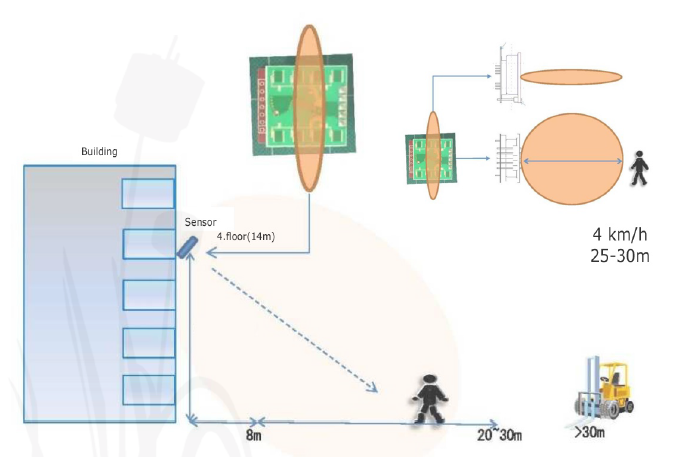 A person can be detected at a distance of 1 2 meters even with smallest standard modules. Many of the plastic materials are more or less transparent for microwave radiation. 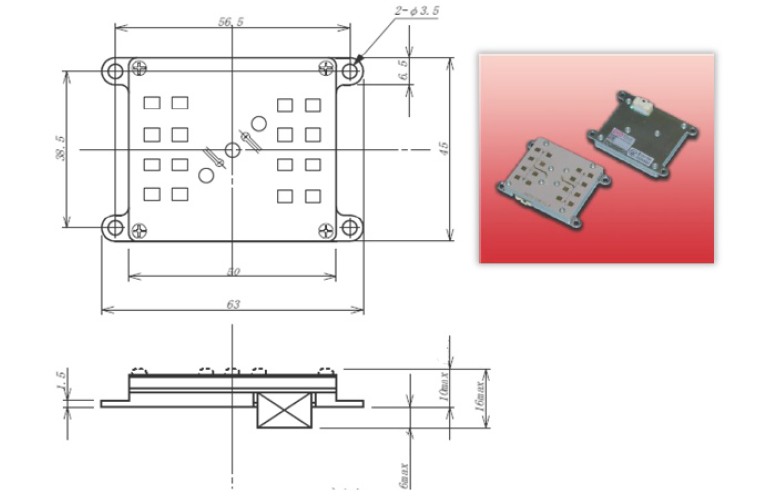 Therefore, the sensor module can easily be hidden behind a plastic panel which is a huge advantage for the outdoor design of the final product compared to pyroelectric detectors, which need a Fresnel lens for proper operation. The operation of these sensors is based on the Doppler effect to calculate velocity data about objects at a certain distance. The reflected signal radiated towards a desired target has an altered frequency. This variation gives direct and highly accurate measurements of the radial component of the target’s velocity relative to the radar. The difference between the observed frequency and the emitted frequency of a wave for an observer moving relative to the source of the waves is called the Doppler effect. It is commonly experienced when a vehicle equipped with a siren approaches, passes and recedes from an observer standing still. The received frequency is higher (compared to the emitted frequency) during the approach, it is identical at the instant of passing by, and it is lower during the recession. This changing of the frequency also depends on the direction the wave source is moving with respect to the observing point. The Doppler radar is used to detect moving objects and evaluate their velocity. A reflective moving object in sight of the sensor generates a low frequency sine wave at the sensor output, which is proportional to the object speed. which is proportional with the speed of the moving object. The amplitude depends on the distance and the reflectivity of the moving object. Exact measuring of velocity is a nice feature, many microwave radar sensors from RfBeam are capable to do this for higher speed regions even. However, to detect presence of human beings with microwave technology is a task, where it is enough to measure speed up to 1 m/s (3,6 km/h), but a tiny, cheap and simple to use detector needs to be used. While conventional microwave sensors or modules need to have complete circuit built around to get them to drive for instance an intelligent lighting system, there are some easy to use, integrated motion detector modules, based on 24 GHz microwave Doppler-effect technology. 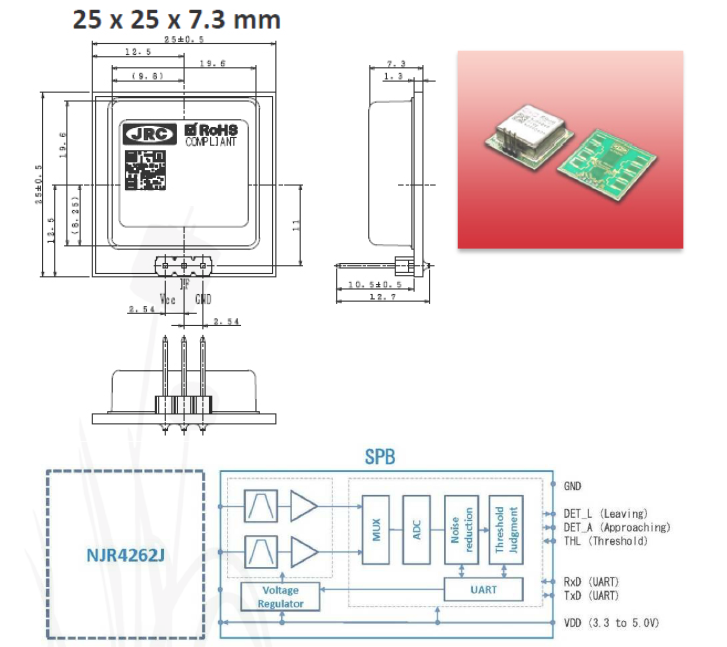 One of them is the NJR4265 from New Japan Radio Corporation, where antenna, RF circuit, IF amp, MCU and voltage regulator are integrated in a small package of the size 14 x 20.4 x 8.8 mm. NJR4265 J1 is intelligent motion sensor that is designed for the sensing of short distance low speed movement object of e.g. pedestrian. 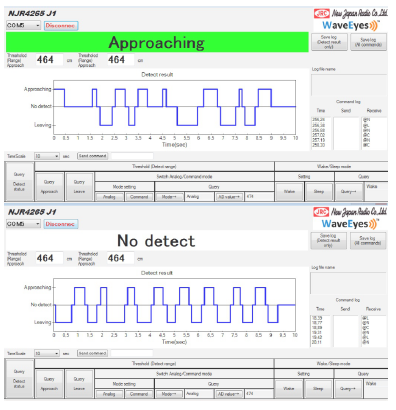 The steady sensing of moving object is realized by embedded software. lt is suitable for the built-in use of the sensing function to various equipment as all functions are integrated in a small package and it can be easily controlled from PC/MCU by UART interface, but stand-alone operation is also possible. The signal processing software is responsible for the steady sensing, enhancing signal from movement object and decreasing random noises, and decreasing mutual interference between sensors. Furthermore, it is also capable of identifying the direction of movement (approaching or leaving). 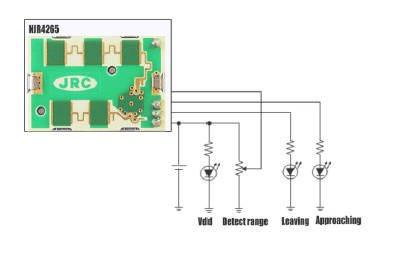 The device is characterized by low operation voltage 3.3-5V and low power consumption, in sensing state the operating current is 60 mA, while in steady state is only 4 mA. 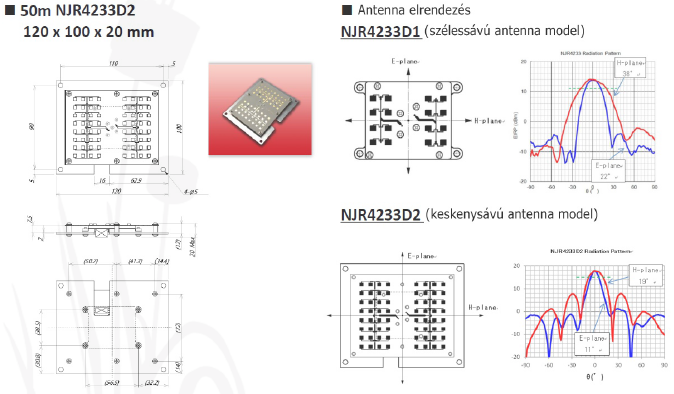 On the block diagram it is visible, that the patch antenna and the RF circuit are built together with the analog filtering and the signal processing circuit. The radiation pattern shows, that this microwave sensor can detect movement both horizontal and vertical directions, which gives a remarkable advantage. The detecting range is maximum 1 0 meters in +/-35 ° with the speed of approaching of 0.25-1 m/s, measured as show on the figure. In order to test the device, there is an evaluation kit available, which translates the UART interface to USB, so that the device can be connected to a PC. As the NJR4265 device is small and based on microwave radar technology, it can be easily built into the controlled system. The very attractive price level and the easy operation and installation makes it possible to use this device instead of PIR based systems or extending it with. Application area is wide, most popular usage is the motion switch of automatic doors, the automatic switch of lighting systems or adding energy saving features to television sets, climate controls or PCs. As the Dopplertechnology makes it possible to use this device for speed measurement, special usage like detecting swing speed of golf or tennis rockets are also possible. An example developed by Endrich was shown on the Industry Days Budapest Expo, where our goal was to indicate visitors’ approaching and leaving with green and red illumination on the booth. In case of customer approaching the RGB LED stripe that was used became green, when leaving us it was lit by red color. The circuitry was very simple, we have installed the sensor in standalone analog mode, and used the approaching and leaving pins to change the 1 -1 0V dimming inputs of two LumoTech LED power supplies which drove the R and the G LEDS of the LED stripe. 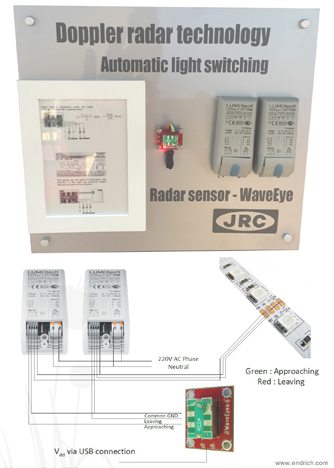 The NJ4262 2 ports and the NJR4269 single port radar modules with integrated radar antenna have been developed especially for lighting switch applications. The emphasize low power consumption (pulse cycle operation), low voltage and low price. They can be ordered at 5V and 3/3.3V supply voltage versions, operating in the EU ISM frequency band of 24.05GHz ... 24.25 GHz. 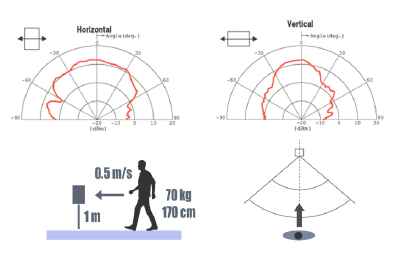 The sensor is able to detect a pedestrian approaching with 4 km/h towards its surface from 30m when horizontally installed. The figure describes the circumstances, the sensor has been installed at the height of 1 4m (4th floor). Within 8m, the detection is unreliable, above that till 20-30m the pedestrian is visible. When a truck or fork lift is to detect, the detection range grows above 30m, as the surface reflection is much higher. Vending machines, air conditioning, LCD TV and LED lamp automatic switch based on human presence. There are different kind of technologies to use for Doppler radars, the continuous wave (CW) or frequency modulated (FM), FSK (Frequency Shift Keying) or their combination the FMCW are the most commonly used in practice. CW Doppler radar only provides a velocity output as the received signal from the target is compared in frequency with the original signal. Early Doppler radars were CW, but these quickly led to the development of frequency modulated continuous wave (FM-CW) radar, which sweeps the transmitter frequency to encode and determine range. FSK radars can measure the distance of moving objects, while FMCW is used to detect distances (ranging) of stationary and moving objects. This type of Radar uses a frequency modulated carrier. Typically, the carrier frequency is changed linearly by applying a saw tooth or a triangle waveform. FSK (Frequency Shift Keying) allows distance measurements (ranging) of moving objects. 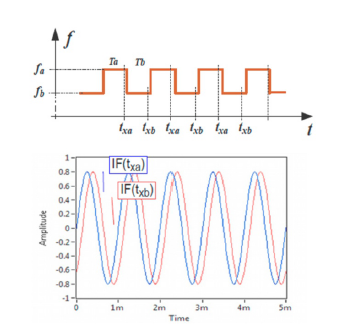 FSK allows a better resolution than FMCW and uses less bandwidth by means of using switching between two discrete carrier frequencies fa and fb, while FMCW uses linear ramps. This technique is also based on the Doppler signals generated by reflective moving objects. Due to the very small step fa - fb a moving target will appear at the nearly the same Doppler frequency at both carriers, but with a different phase. This phase is proportional to the distance of the moving object. At the output of the Radar transceiver a low frequency signal called beat frequency is resulted by the difference between transmitted and received frequencies. Most RFbeam sensors have an analog FM input. Some types can also be modulated under digital control. In KBand (24GHz), maximum allowed frequency modulation depth is < 250MHz, taken tolerance issues and temperature influences in account, the usable frequency shift is limited to typically 1 50MHz. This results in a resolution (and a minimum distance) of 1m. It is important to mention that by both FMCW and FSK techniques it is possible to measure distance, however FMCW is usually used to measure distance of stationary objects, while FSK is used for moving objects. FMCW makes it also possible to detect presence of a stationary object, by first learning the system to the background environment. When a new object is present, the FMCW output will become different form the curve stored for the empty environment therefore detection is possible. The NJR4233 is capable to be installed in outdoor industrial applications, in FMCW mode it is possible to measure distance of stationary objects as well. In FSK mode the speed as well as the distance of moving object can be measured, while in Doppler mode only speed measurement is possible. Above modules are ideal choices for infrastructure monitoring such as highway pay gate control, parking lot occupancy indicator, industrial forklift distance control. Special applications are landing systems and collision control for drones. Elektronet 2016/8 Elektronet : elektronikai informatikai szakfolyóirat, 2016. (25. évf.) 8. sz. 22-26. old. Jövő Gyára 2017/1 2017. (3.évf.) 1.sz. 10-12.old.